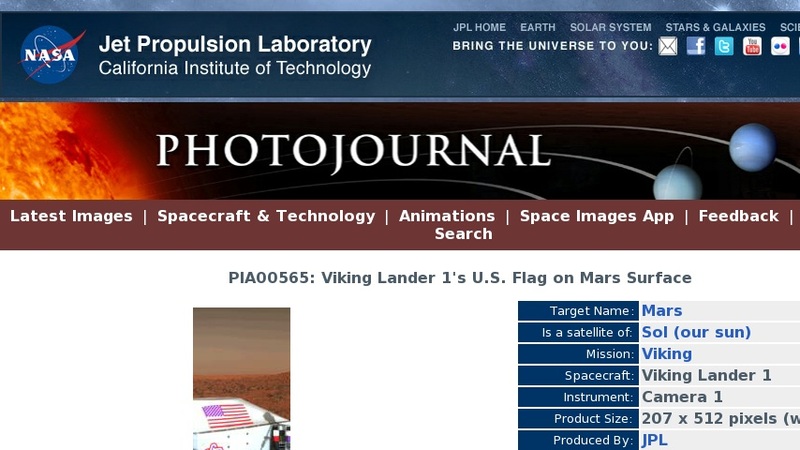 The flag of the United States with the rocky Martian surface in the background is seen in this color picture taken on the sixth day of Viking Lander 1 on Mars (July 26). The flag is on the RTG (Radioisotope Thermoelectric Generator) wind screen. Below the flag is the bicentennial logo and the Viking symbol which shows an ancient Viking ship. This Viking symbol was designed by Peter Purol of Baltimore, winner of the Viking logo contest open to high school science students. To the right is the Reference Test Chart used for color balancing of the color images. At the bottom is the GCMS Processor Distribution Assembly with the wind screens unfurled demonstrating that the GCMS cover was deployed properly. The scene in the background is looking almost due west on Mars. The lighter zone at the far horizon is about 3 km (nearly 2 miles) from the Lander. The darker line below this is a hill crest much closer to the Lander (about 200 m or about 650 feet). The picture was taken at local Mars Time of 7:18 A.M., hence the relatively dark sky and the far horizon illuminated by the sun just rising behind the Lander.